Sturdy windproof umbrella’s unique aerodynamic vents keep it from blowing inside-out, so you stay dry under its large 49" dia. canopy. 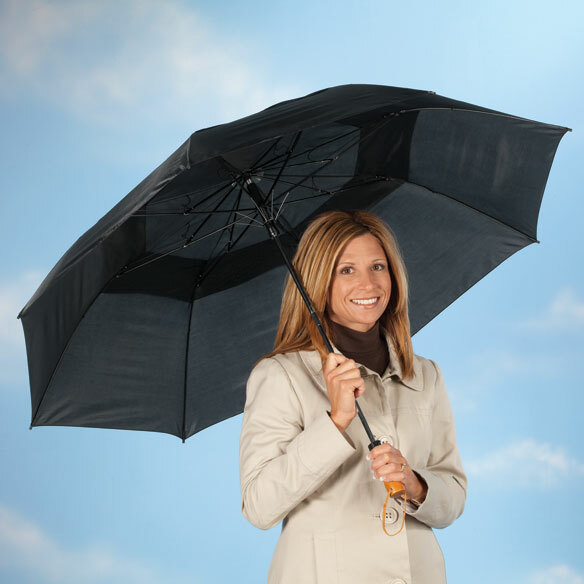 Wind umbrella features easy push-button control, wooden handle with strap, hook-and-loop closure and carry pouch. Folds to 21" L. Polyester/metal/wood. Love it and it works great thank you!!!!! Work's well in the wind. And Chicago has lot's of wind!!!! My umbrella turned inside out during a gust leaving me to walk to a fancy lunch arriving soaking wet. I bought this umbrella. The day it arrived I had the opportunity to use it in a very stiff wind and pouring rain. It is just as advertised. I love it and will get another one to keep in the car. It rains here in New Orleans, it rains a lot. This umbrella is great for downpours and high winds!! This unbrella stood solid in a gusty thunderstorm. Should've invested in this a long time ago!!! Great Product!!! It will replace an umbrella that broke after 3 uses. Love it. It has already proven to be truly windproof. It has already proven to be windproof in strong winds. Great handle! Just long enough to keep a stray dog at bay without being too heavy or hard to handle. It's great to have an umbrella that will not turn inside out in a strong wind. It is strong and well built, a great buy. Have owned this umbrella for several months. There have been no problems, and it has worked well in light winds. Have not tried product in over 20 mph winds. The item is not compact. Not as large as a golf umbrella, but plenty roomy to stay dry. The first time I opened the umbrella to use it was a slightly windy day. The umbrella immediately turned inside out in the wind just as any other umbrella would do. Didn't even make it out into the wind. I bought this for my 20 Year old Nephew for an upcoming trip to South America. It broke the very first time he opened it. I had to mail it back to the company and it cost me $8.00 to ship. I am very embarrassed that I sent him something so useless. I do a lot of Ministry work, and I need a good umbrella when it's raining! Lost several umbrellas turning inside out. I read that it is sturdy and will withstand wind. Tired of umbrella blowing inside out.